Muscle Pain - Muscle Dynamics Clinic STOPS IT! Passive knee extension: Do this exercise if you are unable to extend your knee fully. While lying on your back, place a rolled-up towel under the heel of your injured leg so the heel is about 6 inches off the ground. Relax your leg muscles and let gravity slowly straighten your knee. Try to hold this position for 2 minutes. Repeat 3 times. You may feel some discomfort while doing this exercise. Do the exercise several times a day. This exercise can also be done while sitting in a chair with your heel on another chair or stool. Heel slide: Sit on a firm surface with your legs straight in front of you. Slowly slide the heel of the foot on your injured side toward your buttock by pulling your knee toward your chest as you slide the heel. Return to the starting position. Do 2 sets of 15. Standing calf stretch: Stand facing a wall with your hands on the wall at about eye level. Keep your injured leg back with your heel on the floor. Keep the other leg forward with the knee bent. Turn your back foot slightly inward (as if you were pigeon-toed). Slowly lean into the wall until you feel a stretch in the back of your calf. Hold the stretch for 15 to 30 seconds. Return to the starting position. Repeat 3 times. Do this exercise several times each day. Thoracic outlet syndrome occurs when the size and shape of the outlet is compressed and narrowed. This can happen because of posture, muscle tightness, exercise, trauma, pregnancy, or being born with an extra rib. Tingling or numbness in the fingers, hands, arm, shoulder or neck. Weakness of the hand or arm. Aching in the shoulder or neck. Symptoms may be worse when the arm is lifted above shoulder height. Scalene stretch: Sit or stand and clasp both hands behind your back. Lower your left shoulder and tilt your head toward the right until you feel a stretch. Hold this position for 15 to 30 seconds and then come back to the starting position. Then lower your right shoulder and tilt your head toward the left. Hold for 15 to 30 seconds. Repeat 3 times on each side. Pectoralis stretch: Stand in an open doorway or corner with both hands slightly above your head on the door frame or wall. Slowly lean forward until you feel a stretch in the front of your shoulders. Hold 15 to 30 seconds. Repeat 3 times. Scapular squeeze: While sitting or standing with your arms by your sides, squeeze your shoulder blades together and hold for 5 seconds. Do 2 sets of 15. Arm slide on wall: Sit or stand with your back against a wall and your elbows and wrists against the wall. Slowly slide your arms upward as high as you can while keeping your elbows and wrists against the wall. Do 2 sets of 8 to 12. 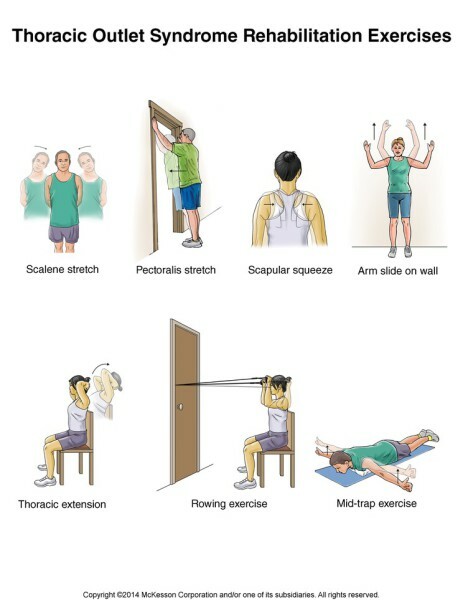 Thoracic extension: Sit in a chair and clasp both arms behind your head. Gently arch backward and look up toward the ceiling. Repeat 10 times. Do this several times each day. Rowing exercise: Close middle of elastic tubing in a door or wrap tubing around an immovable object. Hold 1 end in each hand. Sit in a chair, bend your arms 90 degrees, and hold one end of the tubing in each hand. Keep your forearms vertical and your elbows at shoulder level and bent 90 degrees. Pull backward on the band and squeeze your shoulder blades together. Do 2 sets of 15. Mid-trap exercise: Lie on your stomach on a firm surface and place a folded pillow underneath your chest. Place your arms out straight to your sides with your elbows straight and thumbs toward the ceiling. Slowly raise your arms toward the ceiling as you squeeze your shoulder blades together. Lower slowly. Do 3 sets of 15. As the exercise gets easier to do, hold soup cans or small weights in your hands.